The beach is only a few steps from the resort. Sit back on the pool deck and savor the cool breeze on a warm day. Spacious rental accommodations give your family the space you need. Located in a calm residential community, you're away from all the noise. You're right on the beach in North Myrtle Beach. It's known for it's mellow vibe and a great resort community. Windy Shores II is located in North Myrtle Beach, close enough to enjoy all of the shopping, dining, and amusement parks that the area has to offer, but far enough away to enjoy a peaceful vacation. The resort has a vintage southern feel and is a perfect home base for your family. I hope you packed your sunblock because I have a feeling that you won’t be spending a lot of time indoors. There’s an outdoor pool, where you can finally settle the matter of who the family’s fastest swimmer is, once and for all. Lounge poolside with the latest issue of US Weekly and catch up on your celebrity gossip while the while the kids splash around. You have direct access to the beach – a short walk past the dunes. Reapply sunblock and grab your beach gear. Go for a stroll along the sand and collect seashells with the kids, or help them build a sandcastle. Two- to three-bedroom condos sleep six to eight guests and are air-conditioned. All condos have full kitchens because sometimes a mini-fridge just isn’t good enough. Bring the kids along to Super BI-LO for groceries, and stock the refrigerator with everyone’s favorites. Back at the resort, declare it a top-your-own-pizza night and the let the kids go wild. See who can make the pizza with the most unusual (yet edible) ingredients. While you enjoy the pizza, catch your favorite show or the big game on the Cable TV. In-suite washer/dryers allow you to save space in your suitcase (more room for souvenirs!) At the end of the night, gather the family on the private balcony and watch the sunset. Get started filling that extra space in your suitcase at Barefoot Landing. 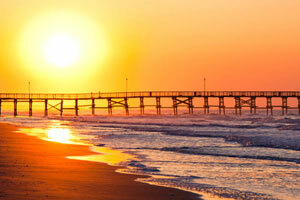 Visit the Barefoot General Store for Myrtle Beach souvenirs, specialty food products, and candy. Cariloha features apparel for women and men that is made out of bamboo. Del Sol has apparel and accessories that change colors when exposed to sunlight. Master’s Editions Fine Art Gallery features art by Thomas Kinkade, Mark Keathley, and Abraham Hunter. Get a new pair of sunglasses by Coach, Burberry, Versace, or Tiffany & Co. When the kids get hungry, check out House of Blues, Johnny Rockets, or Stillhouse BBQ. If you’re up for even more shopping, there’s Broadway at the Beach. Little ones will love Build a Bear, where they can create their own stuffed animal and build it themselves, and they’ll spend hours in Toys & Co. if you let them. Tsunami Surf Shop features high-end surf fashion for women, men, and kids. Design your own flip-flops at the Flip Flop Factory. Go for a ride on the SkyWheel; it’s almost two-hundred-feet tall. Thanks to the climate-controlled gondolas, everyone can ride in comfort. Family Kingdom Amusement Park features over thirty-five thrill, family, and kid rides that everyone in the family will love including rollercoasters, bumper cars, bumper boats, a carousel, go karts, and a train. - There is no front desk at this property. To make arrangements for check-in please contact the property at least 24 hours before arrival using the information on the booking confirmation. - Guests must contact this property in advance for check-in instructions and a lock box code. For more details, please contact the office using the information on the reservation confirmation received after booking.